The Chesapeake Symphony Youth Orchestra welcomes phenomenon violinist, Stefan Jackiw, to perform Mozart’s regarded Violin Concerto No. 3 in G major, K. 216, conducted by Maestro Julien Benichou. 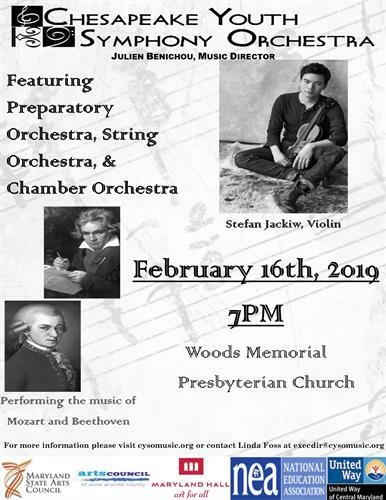 The concert will take place at Woods Memorial Presbyterian Church at 7pm, on Saturday, February 16th and will feature the CYSO’s own String Orchestra, Preparatory Orchestra and Chamber Orchestra. Admission is free. For more information please contact Linda Foss at 443-758-3157 or at execdir@cysomusic.org.